Google released the Android 7.1.2 beta update only for Android Beta Program users, but the final update will be pushed later. Couple of weeks back, Google announced Android 7.1.2 Nougat Beta update for users of Android Beta Program. Which means, the users who have enrolled under Android Beta Program with their Google Pixel, Pixel XL, Nexus 5X, Nexus Player and Pixel C devices will receive an OTA (over-the-air) update before anyone else by default. Unfortunately, Google Huawei Nexus 6P users will have to wait for some time as the company is preparing an update and expects it to release soon. If you have one of the following devices – Google Pixel, Google Pixel XL, Google LG Nexus 5X, Nexus Player and Google Pixel C, but did not enroll under ‘Android Beta Program’ then here’s what you need to do. 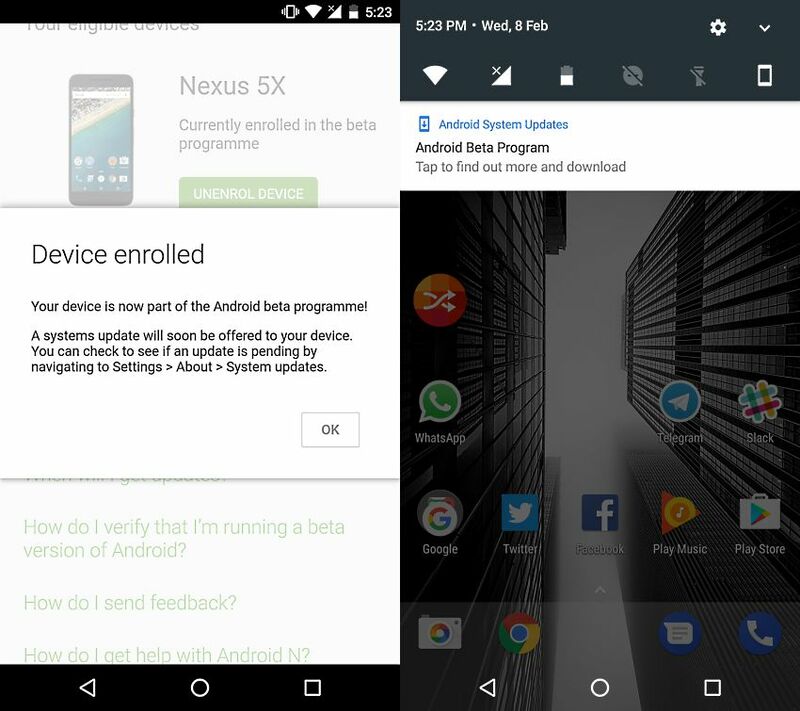 How to enroll for Android Beta Program? To enroll for Android Beta Program, you need to visit ‘google.com/android/beta‘ or ‘android.com/beta‘ and log in with the same Gmail ID that you are using on your eligible Android (Nexus or Pixel) device for Google Play. You can log in either by your phone or any computer. Just type – Google.com/android/beta – OR – Android.com/beta – in any web browser on a phone or a computer. Once logged in, scroll down to see “Your eligible devices” and tap/ click on green “ENROL DEVICE” button next to the eligible Nexus or Pixel device. This can also be done either on a PC or your phone. As soon as you enroll your Nexus or Pixel device, a system update notification will instantly come to your device asking you to download the update, just make sure that you are connected to a Wi-Fi and have free storage space available on your device because the update will be heavy in size (usually around 1GB). If you don’t see the notification immediately then you can go to phone’s Settings > About > System updates or sit patiently as it will soon be made available by Google (Note: it can take up to 24 hours). Hit download and wait for some time depending upon your internet connection speed. In case of Google Pixel XL the Android 7.1.2 update is of 827.9MB size in India, and 1252.4MB (approx. 1.2GB) for Nexus 5X. Now that the device has downloaded the update, you’ll see a ‘Restart and Install’ option on the same update page. Hit the button and let your device do rest of the work. It will take some good amount of time, so no need to panic. Also, do not force stop or shut down the process as it can brick your smartphone or you might loose all your data. This Android 7.1.2 update for Google LG Nexus 5 brings the Swipe down fingerprint gesture for Notification access, just like the Google Pixel phones, along with some app shortcuts, image keyboard support and more.